I think the last movie I went to was Dr. Seuss’ The Lorax with my parents and my son. My dad loves his popcorn. I think it is to him what chocolate is to others. So, we always grab an over-priced tub and usually share it amongst one another. After we leave the theater we discuss as to why we spent so much on going to the movie theater and that oh so tasty treat… I suppose it is because my son enjoys it so much! We don’t go to a lot of movies. Number one reason, we live over an hour and a half from the city. The second reason is that it’s so expensive and movies are often out on DVD before we know it. Save some money and stay home. Rent the DVD or even buy it! Don’t want to miss out on that delicious-movie-theater-dripping-with-butter popcorn? Try an inexpensive popcorn machine. You could keep your family home and watch the DVD of your favorite movie with your own private popcorn popper for less than the cost of going to the movies! Plus, you’ll get to enjoy that movie theater popcorn right in the comfort of your own home. You can save even more by buying jars of popcorn and popping it in a skillet on top of the stove. I use coconut oil, which gives it such a good flavor. I’m using yellow corn right now, but you can also buy white corn. If you pop your popcorn on the stove top, try putting about a tablespoon of butter in with your oil. You’ll get a great butter flavor! I love the idea of using a popcorn machine. Half the time when popping on the stove, it doesn’t come out right. A popcorn machine is very economical. I could eat popcorn almost every night! I like this popcorn machine! My sister bought one that looks like this machine, but smaller! Making my own homemade popcorn is the best, and with a machine it tastes fresh! I agree that movies are just way too expensive and I don’t have a car so I take the bus everywhere. By the time I get there I’m too worn out to enjoy the movie! LOL! I will make a point to try this popcorn and recreate the theatre experience at home! I would love to try this popcorn. Sounds yummy! That I can let my family watch the DVD of our favorite movie with our own private popcorn popper for less than the cost of going to the movies!! That is AWESOME!! It is cheaper to stay at home to watch your movies and use your own popcorn machine. I’ll have to check out one of those. I really didn’t learn anything new, but I can say that I totally agree! My family loves movies and popcorn. I’ve found there is a way to make movies educational as well as entertaining and we’ve been working on that this summer… Always with popcorn. Our microwave died about a month ago, which was not a big deal really. About the only thing we use it for is to pop corn and heat water for tea. My children were astounded that popcorn could be made without a microwave. I only had a huge box of microwave popcorn at the time, so I cut open a bag and put the contents in a pan, added a little extra oil and popped away. My kids though I was a super hero that day! I didn’t bother to replace the microwave… Instead, I bought a couple of huge jars of popcorn and some special oil for popping corn. Every once in a while, we do hit a movie theater once or twice a year, though… Being in a darkened theater with that huge screen, the awesome, intense surround sound… Well, that’s an experience I don’t want my children to miss out on completely, expensive or not. Buying a popcorn maker would pay for itself several times over with what they charge for it at the movies. Our neighbor bought one & just had a birthday party for her son where they popped popcorn, made balloon animals, & had all kinds of fun! I usually prepare popcorn in oven. But this sounds like a good option too.. They still sell popcorn machines? My mom had an air-popper when I was young, they were the new “thing”…I only see microwave popcorn at the store, I will have to investigate this, I gave up microwave popcorn because I read so many bad things about it. thanks, I know what my next kitchen buy shall be! My favorite type of popcorn is the type you pop yourself! Popcorn Machine?! Awesome!! I want one! I learned it is cheaper to stay home to watch a movie and make popcorn with a popcorn machine. I learned how to make soda from the adorable video on your youtube channel. When I was a kid, we would make popcorn on the stove – usually several batches – and dump it in a grocery bag. we’d then salt it and perhaps melt some buteer to pour on it, then close the bag and shake it thoroughly. Always a yummy treat for the whole family! I learned that I can buy a movie theater-style popcorn machine for a pretty reasonable price. 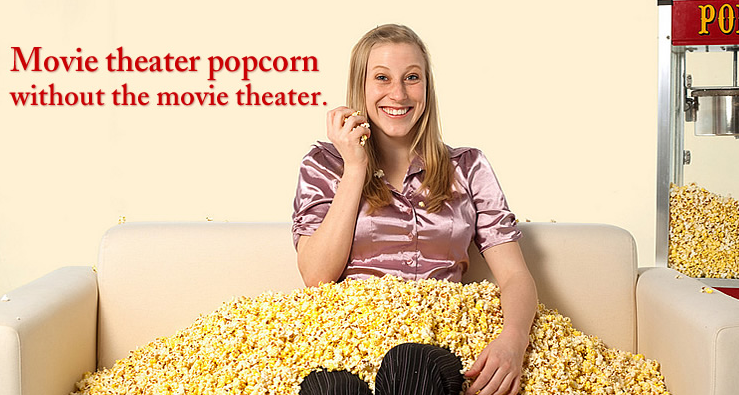 Theater popcorn is so expensive! I would definitely save money if I bought a popcorn maker and watched movies at home! Thanks for the post! a machine that makes it TAST like movie qulity??? It is very expensive to go to the theatre. We only go for something really special and wait til it comes out on DVD or Tv. I learned that you can find inexpensive popcorn machines on sale for $100 on the site listed above and that they offer a 30-day Money Back Guarantee if you do not like the product. I learned that you can make movie popcorn at home and the machine will more than pay for itself very quickly vs going to the movies & buying it there. Great blog post! thanks for all the great tips!! I LOVE this idea! Thanks! We so rarely go to the theater any more but we miss the popcorn! I had no idea this was an inexpensive option! What is it that gives movie theater popcorn that great flavor? I love the taste.